First ring: April came to us for the first time in April of 2013. She liked a stock design on our website, but had some modifications to it, so we made her a custom ring and set the center stone that she purchased from us, as well. We finished the ring, sent it to her, and her boyfriend proposed while they were on vacation. 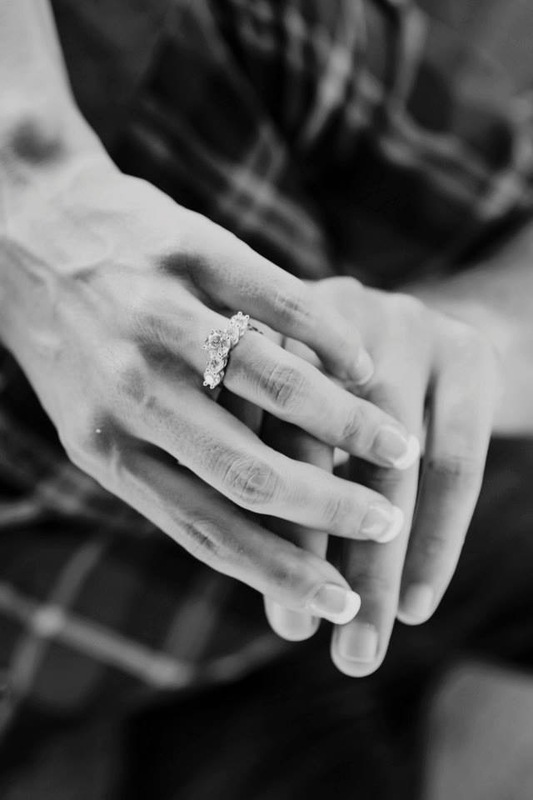 At first, she loved the ring. She thought it was perfect. 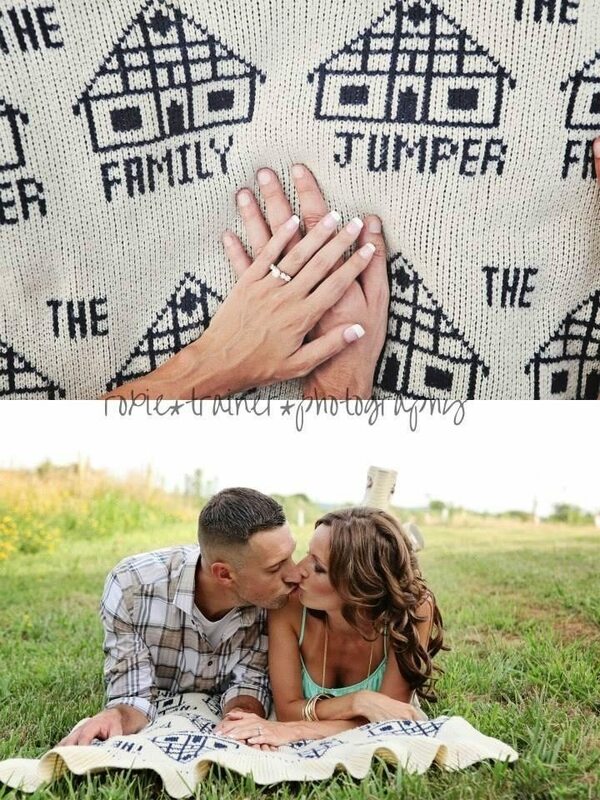 She even sent us pictures of the ring and the proposal, and it made everyone here jealous. Second ring: Around June of 2013, April had a change of heart. It wasn’t so much that she didn’t like the ring, but after seeing a friend’s ring, she decided that she really wanted a little more bling. Even though the ring she bought was custom, we don’t like seeing our customer’s unhappy, so we took back the first ring and redesigned a new one. It used the same basic design, but we incorporated larger side stones and thinned out the metal used to set the stones a bit more so that she got more bang for her buck. We set the original center stone on the new ring and sent it to her, and she and her fiancé took some new engagement photos and sent them in, as well! Still beautiful, but now even more impressive! I mean, just look at the smile on her face with the second ring. Wedding band: April let us know right away that she would be back for a wedding band when the time came, and she lived up to the promise. 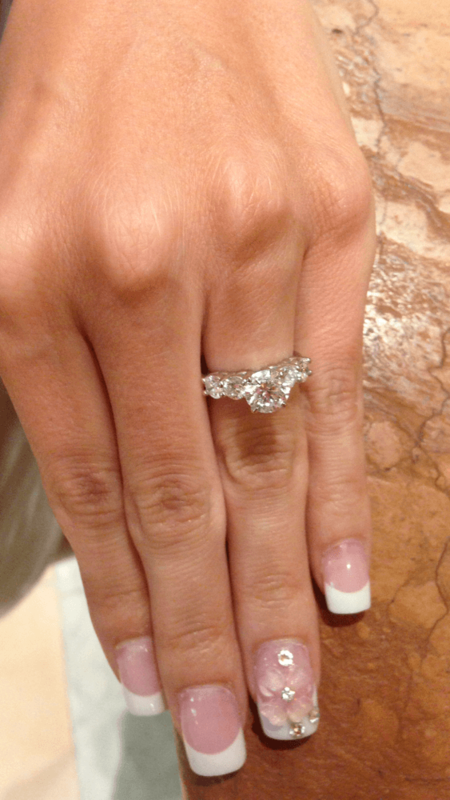 At the start of 2014, we began designing a matching band for her upcoming wedding. A classic five stone band using the same size stones, we made sure that it would sit flush and designed it so that she could solder the two rings together after the wedding. During the time we were working on the band, April was so excited about her wedding that she shared a few pictures from her dress fitting with me, and I made her promise to send me some pictures from the actual day because the dress was amazing. We finished the band and sent it to her, and she was thrilled. April and Michael were married in April, and she sent me a few pictures from the wedding as well!